* Please Note: This model is a direct replacement to the previously available FMI Windsor 36" See Thru Woodburning Fireplace 368ST. 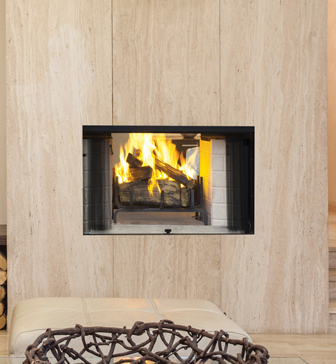 The Superior Windsor see thru woodburning fireplace is modern and sleek. It adds so much beauty to any room. The really unique feature about this fireplace is its see thru back wall. If you place it on a wall between two indoor rooms you can achieve a look that simply can't be duplicated! 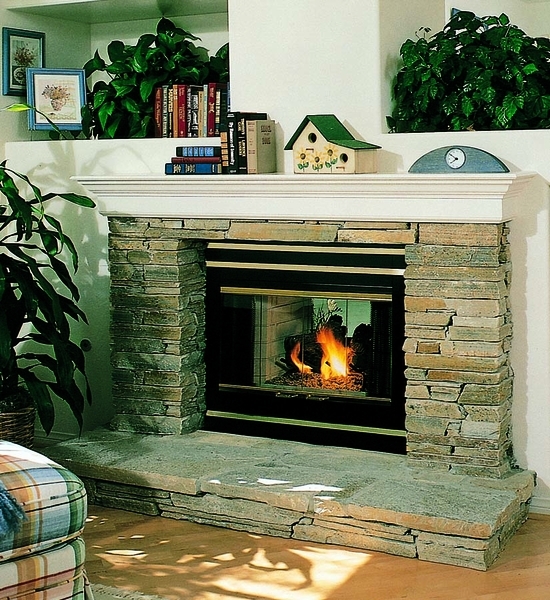 This 36-inch fireplace has gas and outside air knockouts and only uses Superior 8-inch chimney. The face is smooth in order to be used with natural stone facing. This natural appearance will make a showy centerpiece to any room and you will also enjoy the warmth it puts off. Hi, there - are there 'fan' or air circulation options available with this fireplace? In other words, if we wanted there to be a fan circulating hot air from the wood burning insert to the surrounding area? Unfortunately, no blower is available for this model or most all of the Superior wood burning fireplaces with nomenclature starting with "WRT." Any fireplace offered by Superior with the prefix of "WCT" will offer a circulating blower as this will designate the fireplaces as a "wood burning, circulating, top vent" fireplace, but Superior does not offer a see-through wood burning fireplace that may be used with a circulating blower. Unfortunately, we do not carry any see-through wood burning fireplace that may be used with a blower. Just starting this project plan... need insight and help here. I want to buy this fireplace to replace a current gas only fireplace on an outside wall. The Chimney and fireplace has a wood surround outside. My thought is to use a stone or brick facade from the ground all the way up and on the sides of the box, with the glass wall back, which would give visibility to folks on my patio (allowing me to remove the chiminea, which takes up space and doesn't look as nice). So, what do I need to measure and/or check out to figure out what I need to buy and if code will even allow me to do this? Ideas? Unfortunately, there is no way to get a tight seal on a woodburning see-thru fireplace and the doors would create quite a draft in the home. It would constantly draw air from your home to the outside and decrease any energy efficiency measures you might have taken. Double sided direct vent units with outdoor glass kits are the best option for this application but they will be gas only. The picture online shows a wide black surround. What is the actual width of the fire viewing area? I am installing this between a living room and master bedroom using an existing chase built for an existing wood burning (with gas log lighter) unit currently on the bedroom side. The actual viewing glass is 22.5" by 36.5". This fireplace weighs 225 lbs. Can this be used outside on a deck within a masonry surround? This fireplace lacks the stainless construction necessary for outdoor installation and will rust. Does this model also include glass doors? While doors are not included as standard, they are available. The doors are listed in the accessories tab on the item page. Customer service was outstanding and delivery time phenomenal. Plus, it's very easy to install and easy to follow directions. Already installed, looks great!!! Just waiting for marble slab.